Memorable Wedding: Your Wedding - Prettiest in Pink! Your Wedding - Prettiest in Pink! 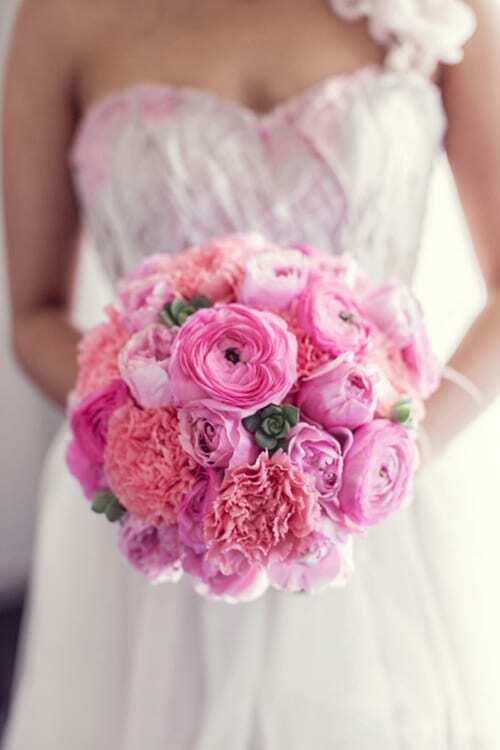 One of the most popular color schemes for weddings is pink. This is with very good reason; there are so many different directions that you can take a pink theme. Read on for some tips about having the prettiest pink wedding. Pink can be many things. Pale pink conveys a delicate and classic effect. Bermuda pink can be preppy or the height of femininity. And for the bold bride, there is always hot pink! Combining a range of pinks is also wonderful. You can achieve other moods by mixing pink with another color. Pink with white is pure and sweet, pink and brown are chic and sophisticated, and pink and green are preppy and fun. A nice thing about a pink color palette for your wedding is that pink elements are so easy to come by. Almost any flower that you can dream of will be available in pink. Whether you love tulips, roses, lilies, hydrangea, snapdragons, or gerbera daisies, you will be able to find your favorite blossoms in a shade of pink (and often in several shades). That makes it very easy to design the floral displays of your dreams, whether your style is elegant orchids or impressive Stargazer lilies. Table linens are another part of your wedding décor that will look great in pink. The tables are a good place to think about mixing in a second color. So if you have pale pink linens, use white brocade napkins with silver vases for a formal wedding. Or you could choose to use rich espresso brown napkins over a brighter pink tablecloth for an evening wedding. The possibilities are literally endless. When planning a pink wedding, don't forget about lighting. Pink is a fabulously flattering color on anyone's skin. If you are having professional lighting, definitely ask them to use some soft pink lights in the dining area. For fun, you could use hot pink spotlights on the dance floor. A very simple way to cast a pink glow over your reception is with tea lights in pretty pink votive holders. No pink wedding would be complete without pink dresses for the bridesmaids. Just like lighting, this is a great choice, because pink is such a universally flattering color to wear. Delicate pink shantung dresses would be just right for a daytime wedding, and richer shades of pink in glowing satin are perfect for the evening. You can also choose a fabric with a design or pattern, such as a strapless cocktail dress with pink and blue stripes, or a stunning pink and white toile. 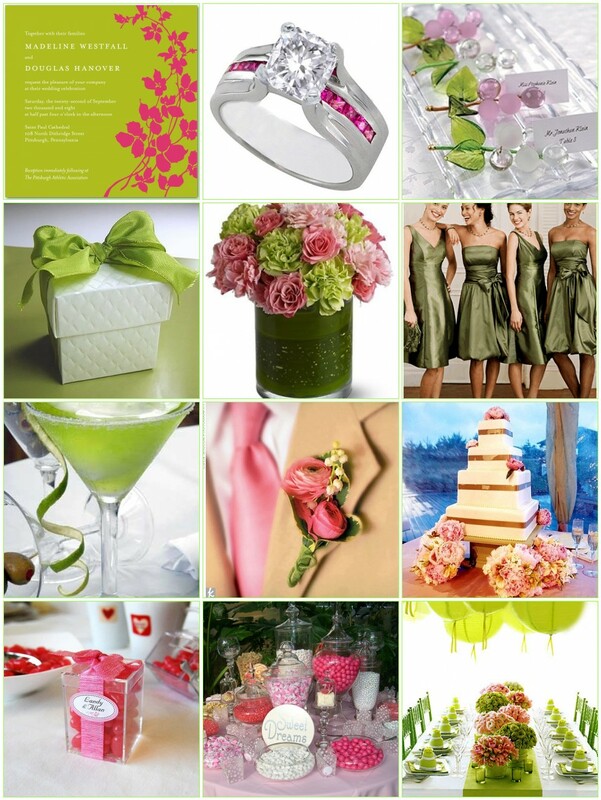 For your bridesmaid jewelry, you will find many terrific options in pink. Pale pink pearls are very romantic for your attendants. If you like more sparkle, check out Swarovski crystal bridesmaid jewelry, which comes in every imaginable shade of pink. You can also go with the classic look of a strand of pearls and dress it up with a pink bow instead of a regular clasp. Some brides also like the look of white pearls mixed with pink crystal accents. The bride herself can get into the act with pink details on her wedding gown. A pink taffeta sash would make a lovely addition to a simple white or ivory dress. Another idea is to wear a bridal gown with pink embroidery on the bodice. If you prefer the all-white look for your dress, you can pull in a hint of pink in your bridal jewelry. Pink is just a wonderful color to work into your wedding. There is no limit to the ways in which you can include it, and pink is always pretty. Pick your perfect shade of pink and design the prettiest pink wedding ever!